At first they lost their civil rights, then their property and, in many cases, their lives. Jews from Lithuania are still waiting for the time when they can at least get their property back. For several decades now Lithuanian Jews who survived the Holocaust, along with other residents of the country, have had little hope of restoration of property rights, due to objective reasons. Lithuanian citizens who survived the Soviet and Nazi occupation have finally been allowed to get back private property seized or at least get compensation. Many have made use of this right. Those who had to flee to save their lives during World War II and their descendants find themselves in a completely different situation. Until now, Lithuanian laws categorize those seeking to have their rights to property restored according to citizenship: those who don’t have it still cannot get their property back. “You have to be a citizen to get property back,” Lithuanian Jewish Community chairwoman and attorney Faina Kukliansky said. “But what if you don’t want to be one? How can one be forced to become a citizen of Lithuania?” She says she has clients who still haven’t been to get real estate in Lithuania back. For at least some of the Litvaks living abroad, it’s not about the money, it’s a matter of principle. “I have a client in Argentina whose mother is still alive. They are from Eišiškės. He needs the house, nothing more. Actually he doesn’t need it for himself, they’re affluent people, they’ll probably give the house to someone. But the important thing is, why aren’t they returning that house to him?” Kukliansky, who has been in communication with Holocaust survivors and their descendants for many years, asked. Her uncle, former Israeli Knesset chairman (1988-1992) Dov Shilansky, was unable to get back property in Šiauliai right up to the time of his death. The issue of restoration of Lithuanian Jewish property has been stuck for a long time because of the complex legal, political and even historical disputes, with the state unable to define clearly the relationship between former and current citizens, witnesses to the unpleasant past. Member of parliament and historian Arvydas Anušauskas has studied the documents of the Provisional Government and acknowledges these decisions violated the terms of the Lithuanian constitution, defining property rights in terms of ethnicity. He says that although Lithuanian sovereignty was declared in the summer of 1941, it didn’t actually exist, and the restored state of Lithuania hasn’t recognized as valid the decisions made by the Provisional Government. “Lithuanian declared the principle of continuity with the constitutions adopted before the occupations,” Anušauskas stressed. Ever greater confusion arises over the current laws on citizenship and the restoration of property. Although article 23 of the constitution proclaims “property is inviolable” and “the rights of ownership are protected by law,” the Constitutional Court on December 22, 2010, issued a finding that the article of law granting the right of restoration of property to citizens only did not violate the constitution. Earlier, on November 13, 2006, the Constitutional Court found the long-standing article in the law on citizenship which didn’t recognize the right to citizenship for those who had repatriated to their native lands did violate the constitution; Litvaks who have left Lithuania for Israel were considered to have repatriated to their ethnic homeland. For many this meant a lost opportunity: the law on restoration of surviving property to citizens of Lithuania only allowed applications to be submitted until December 31, 2001. In their 2010 decision the Constitutional Court additionally indicated that Lithuanian citizens who hadn’t been granted citizenship by the end of 2001 had lost their right to apply for property restitution. This allowed the Lithuanian courts in considering Litvak cases to ignore the exception legislators had written into the law which said the deadline for making application could be extended if important reasons to do so were found. Delayed restoration of citizenship is not considered one of those important reasons. “As I understand it, there is no more important argument than the Constitutional Court’s recognition that part of the law violated the constitution, but the Constitutional Court and the Supreme Court resolved the individual had to be a citizen when the law on the restoration of property rights was in force,” Kukliansky said. The newest amendment to the law on citizenship adopted by the parliament on June 23, 2016, nonetheless does not allow restoration of citizenship to former Lithuanian citizens and their descendants “who left Lithuanian territory to enter the territory of the Soviet Union after June 15, 1940.” This excludes from restoration of citizenship Jews who fled into the depths of the USSR in the summer of 1841 to escape the deadly attack of the German army. According to the Lithuanian Migration Department, in spite of these limitations, many more foreign citizens including Jews have begun to pursue the right to restoration of Lithuanian citizenship recently. In 2016 there were 651 people from Israel and 119 from the Republic of South Africa, where there is also a large Litvak community, who received Lithuanian citizenship through the restoration process. In 2017 the number of Israelis who had Lithuanian citizenship restored was 1,122, as did 408 RSA citizens. The members of the famous Frenkel family spread around the world cannot overcome the barrier of the courts, either. One of them, American University in Paris professor Roy Rosenstein, has had Lithuanian citizenship restored. Getting back lost property is proving to be much more difficult. “The Soviets, then the Nazis, then Soviets again nationalized our house and factory. After independence Lithuania also nationalized our private property. It would be honest to recognize us as the owners. After all, the property still bears our name,” Roy Rosenstein said. He’s the great-grandson of the industrialist Chaim Frenkel and grandson of Jokūbas Frenkelis who ran the Frenkel leather factory in the period between the wars. The leather factory Chaim Frenkel started on the edge of the city of Šiauliai in 1879 became a phenomenon in industry in the Russian Empire and brought in solid profits right up till World War II. In the period between the wars Chaim’s son Jokūbas established a shoe factory called Batas within the grounds of the other factory. World War II, however, cut the family’s ties with Lithuania. “Over 100 relatives, among them Chaim’s wife and most of my grandfather’s close relatives, were murdered in the Holocaust in Lithuania. Surviving branches of the family live in diaspora around the world, from Lithuania to Israel, the USA, South Africa, the Netherlands and France,” Rosenstein said. 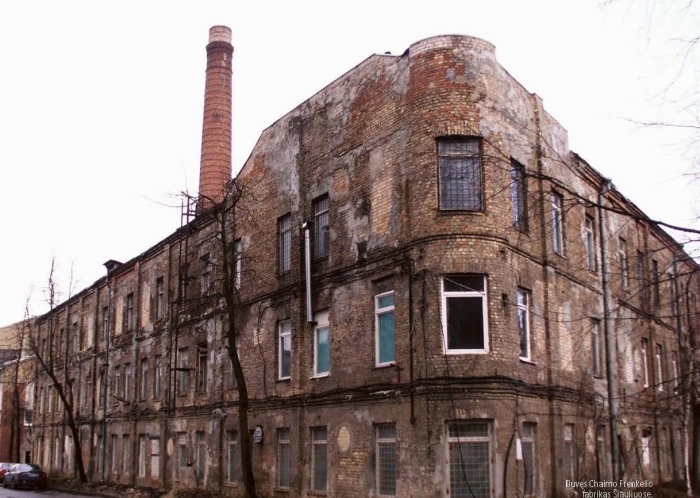 The factory ruined during the war was rebuilt by the Soviets and operated right up to the restoration of independence. In 1992 it was privatized, although by that time the Frenkel descendants were already taking the first steps towards property restoration, and then it went bankrupt in 1996. Now the premises of the Frenkel factory houses many small business enterprises and the building is being maintained poorly. Rosenstein says if his grandfather were alive “as a Lithuanian patriot” he would gladly invest in the factory. While a decade ago the Constitutional Court was deciding issues connected with the fate of Holocaust victims and their descendants, the nation’s leaders undertook new obligations. On June 30, 2009, Lithuania along with other countries signed the Terezin Declaration defining the basic principles for restoration of property lost by the Jews of Europe. Signatory states recognize the importance of taking into consideration the aspiration of former real estate owners and their descendants to get back the private property lost or to receive compensation. By 2011 the Lithuanian parliament had adopted the law on the goodwill compensation for Jewish communal religious real estate, putting an end to earlier often impassioned discussions on the restoration of communal Jewish property. Although there was no lack of disagreement on what constitutes lost Lithuanian Jewish communal religious property, Lithuania took an important step forward towards historical justice with the foundation of this fund. The total sum of 37,000,000 euros in compensation is to be paid out by the state by 2023. The money is allocated for financing Lithuanian Jewish religious, cultural and social projects. The LJC chairwoman says it is currently impossible to say what burden the state would bear if the decision were nonetheless made to start returning to property to Jews of Lithuanian origin. “I don’t think this would be a great burden on the Lithuanian state. There were 250,000 Jews living in Lithuania, of whom 95 percent were murdered and 5 percent survived. But not all of them owned property. Furthermore, not all would make claims,” Kukliansky said. She said if the Government agreed, the LJC could collect information within two years on Lithuanian Jewish private property to be returned. Based on this information, it would, she said, be possible to continue the discussion on restoration of property or at least symbolic compensation. There are increasing signs lately Lithuania likely won’t be able to exonerate herself merely through compromises already reached in the dispute over communal property. As earlier, pressure is being brought to bear on the countries of Central and Eastern Europe from the other side of the Atlantic. United States president Donald Trump signed a law on May 9 of this year requiring the State Department to provide annual reports to Congress on how the European states are living up to their obligations to return property seized during the Holocaust. During debate on the proposed legislation in the House of Representatives in April, representative Ed Royce called it a tool “for naming and shaming” and said it the America’s duty to oversee the implementation of the Terezin Declaration. “We have seen how some states are again interested in this topic and we want to continue to apply this pressure,” he said. The issue of restoration of Jewish properties raises a number of painful episodes in the post-war history of Central and Eastern Europe. Although the Jewish people suffered disproportionately in World War II, it’s not just Jews who can make claims for the return of lost property. As hostilities raged and afterwards, from 12 to 14 million Germans were forced to leave their homes. On a smaller scale, millions of Poles were moved out of territory assigned to the USSR. Other peoples in the region also have lesser or greater stories of tragedy. This makes it difficult to find a Central or Eastern European country which has no worries when it comes to claims for the return of property or restitution. In some cases there might be groups of potential heirs to property without citizenship who are much larger than the number of Jews who find themselves in that situation. An expert who spoke to IQ on condition of anonymity said this is making many governments consider the issue of Jewish restitution more cautiously. He called it a kind of Pandora’s box which, once opened, could give rise to many more property claims. Only last year Poland began discussion on legislation for making compensation, legislation which provides the return of seized property exclusively to citizens, their legal descendants, spouses, children and grandchildren. Passage of the law was postponed, but the actions of Polish politicians didn’t go unnoticed. Fifty-nine US senators appealed to the Polish Government in March asking them to create the conditions for Holocaust victims and their heirs to receive compensation for lost property. On the other hand, there are some positive examples in the region of solutions to this complicated issue. Latvia and Estonia set up a restitution process without discriminatory criteria such as citizenship. The World Jewish Restitution Organization and other Jewish organizations no longer have larger claims regarding the restoration of property. Since 2002 Croatia has allowed at least some people without citizenship to make claims for property restoration, and the Czech Republic has sought to lessen the inequity caused by the Holocaust to legitimate non-citizen inheritors who can’t get their property back by setting up a special fund. Lithuania doesn’t look so bad in this context regarding the issue of Jewish communal property. There are still plenty of problems, however, since people granted Lithuanian citizenship after 2001 cannot make any claims for the restoration of private property and the courts don’t consider barriers in effect earlier for getting citizenship are a basis for extending the deadline for making claims. In the future politicians might have to look for legal instruments allowing for the return of property to those who were removed from the ranks of Lithuanian citizens by the twists and turns of World War II. Kukliansky says Lithuanian the situation of Jews is special in relation to other ethnic communities in the country. “Why do I single out Jews? Because Jews have suffered awfully and many times, from the Russian occupation, from the resolutions of the Provisional Government, and from the further orders of the Reich. And after that, there were no longer any Jews,” she said.